Philosophical questioning has continuously brought us to the fundamental questions of truth and meaning. The analytic tradition was not immune to such struggles. The work of 20th century philosophers like Hartry Field, H.P. Grice and Donald Davidson often focused on language, logic and semantics sometimes by way of Alfred Tarski’s work on truth and semantics. To consider semantics is to think of how language is used and how semantic structures help convey meaning and truth to words and sentences. We’ll give a short look at few of their strategies here. In the early 1970’s Hartry Field, in his paper “Tarski’s Theory of Truth” hoped to explain the semantics of natural language ultimately in physicalist terms. He did this through an elaborate critique of Alfred Tarski’s semantic notion of truth. Field then had to attempt to unravel Tarski’s conditions for truth by extending his rules to account for more subtleties. We find that midway though Field’s highly technical paper he quotes Tarski who admits that there are problems harmonizing semantics with scientific postulates (403). Field then has to find a way to carefully amend Tarksi’s truth and he finds a physicalist way of doing so by the scientific concept of a “valence” (406). “The valence of a chemical element is an integer that is associated with that element, which represents the sort of chemical combinations that the element enters into” (Field 406). Field meticulously shows that we can extend the use of the combining concept of valence to a linguistic model, suggesting that even if we try to reduce the concept of valance down to its constituent parts we are still left with approximations. “In other words, the main point of the [Field’s] paper survives when we replace the ideal of strict reduction [à la Tarski] by the ideal of approximate reduction [to get to truth]” (Field 413). Essentially Field was concerned with the problem of finding good semantics for words which thereby emphasized the importance of reducing truth to other semantical notions that were formalized logically as Tarski prescribed back in the 40’s. Field writes “I think they [Tarski’s semantical notions] are extremely important, and have applications not only to mathematics but also to linguistics and to more directly ‘philosophical problems about realism and objectivity” (398). H.P. Grice wants to explain the semantics of natural languages in terms of mental states in his 1957 paper “Meaning.” Grice is slightly less technical than Field and his is not a physicalist analysis. Instead, his ideas are based in the use of ordinary language to convey meaning by means of the intention of the speaker. Grice lucidly writes “perhaps we may sum up what is necessary for A [a speaker] to mean something by x [an uttered sentence with an intended meaning] as follows. A must intend to induce a belief in an audience, and he must also intend his utterance to be recognized as so intended” (288). Oddly, this is the kind of concept that’s better understood when we think of how we are easily misunderstood by the way we intend (or mis-intend) words. Yes we have to admit, words have a meaning before usage, but it’s only when words are coupled with ordinary usage do we comprehend fully what is meant by a speaker’s intention. Two useful terms conceptualize Grice’s intended concept of meaning—type and token. Type meaning is akin to a formal dictionary definition of a word. Token meaning has to do with the way the word gets used in ordinary language. If we are paying attention to the way words are used it’s arguably more of a mental activity to think of a speaker’s usage to know what he means in any number of situations, rather than consulting a dictionary to decode meaning. Usually we think that to derive meaning is to assume that all we have to work with are a bunch of overly formal definitions and delineations of words. However, Grice doesn’t think that either words or sentences are fundamentally needed for successful communication because it’s usually the intention of the speaker’s utterance that conveys the meaning for the listener and for Grice (as mentioned above). Donald Davidson in his 1967 paper “Truth and Meaning” wishes to arrive at a satisfactory account of the semantics of natural languages by applying abstract logical developments to them. Davidson demonstrates that the meaning of words is mostly dependant on the sentences in which the words are used. “We decided a while back not to assume that parts of sentences have meanings except in the ontologically neutral sense of making a systematic contribution to the meaning of the sentences in which they occur” (Davidson 418). Davidson’s philosophy includes a kind of holism where the parts make sense within the use value of the whole. Alfred Tarski is again summoned and quoted so that Davidson can grapple with the transferability of natural language to a formally logical language to understanding meaning better. “Much of what is called for is just to mechanize as far as possible what we now do by art when we put ordinary English into one or another canonical notation” (422). In other words, once the language is formalized into a meta-language then we can better handle how to contend with how to confer meaning—logically. Davidson is concerned with the problem of finding good semantics for sentences, given a semantics for words. This is characterized by his claim that “it is consistent with the attitude taken here to deem it usually a strategic error to undertake philosophical analysis of words or expressions which is not preceded by […] the attempt to get the logical grammar straight” (424). Davidson, Donald. 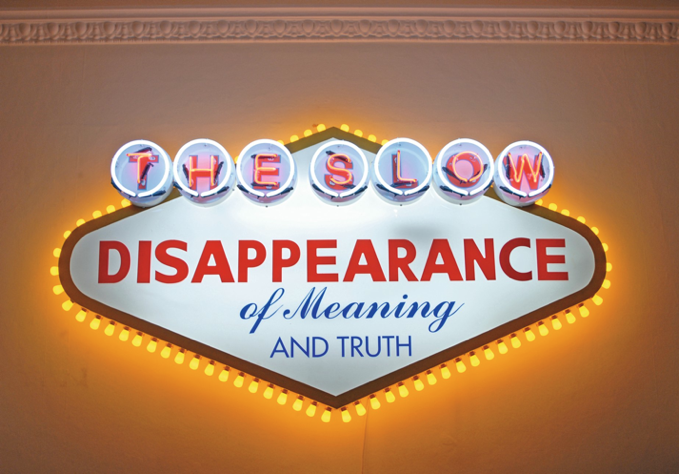 “Truth and Meaning.” The Philosophy of Language. Eds. A.P. Martinich, David Sosa. New York: Oxford University Press, 2013. pp. 416-427. Print. Field, Hartry. “Tarski’s Theory of Truth.” Martinich and Sosa 398-415. Print. Grice, H.P. “Meaning.” Martinich and Sosa 285-290. Print. Tarski, Alfred. “The Semantic Conception of Truth and the Foundations of Semantics.” 1944. Reading the philosophy of Edmund Husserl is no small task. This is the kind of reading that requires patience along with the foresight that one will have to read and reread paragraphs till any semblance of coherence begins to unfold and unfurl. It is tempting bring in the analogy of mining for precious metals, where to find the philosophy, one would have to dig deep through the strata to find a bright and brilliant fragment of value. To think of Husserl’s phenomenology like this is a mistake. Robert Sokolowski toward the end of his paper on Husserl’s categorical intuition speaks of a clarified approach to philosophy in a general “Philosophy only works by quoting, so to speak, the pre-philosophical, and by presenting, from a new and special angle, what was already present in the pre-philosophical” (140). It is as if we must regard the basic experience of categorical intuition as already there in our day-to-day moments to understand it not only philosophically, but also phenomenologically. To do philosophy with Husserl is just a matter of bringing in the methods and challenges of phenomenology to bear in consciousness, to then thematize the minute complexity that’s already present in the totality of the experiences, perceptions, cognitions, and intentions themselves that are already alive with conscious experiencing. The goal for this post will not be to summarize Husserl’s phenomenological project. 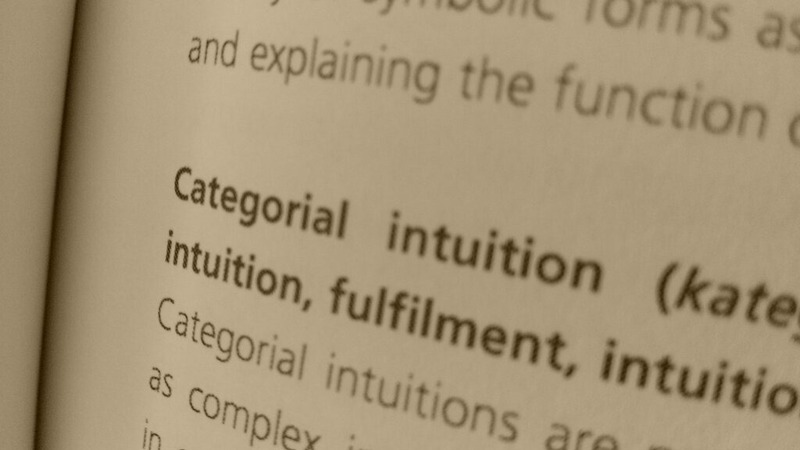 Instead, we’ll turn our attention to a single feature, categorical intuition. This choice is not random since it will lead to some fundamental questions concerning Husserl’s early work developing phenomenology in the Logical Investigations. We’ll also look to Martin Heidegger’s elaboration and extension of the term in his 1925 lecture series titled History of the Concept of Time, these were the preliminary lectures that put forth much of the groundwork for Being and Time. It is also important to pay gratitude to Robert Sokolowski’s paper “Husserl’s Concept of Categorial Intuition.” Sokolowski always has a masterful way of making Husserl’s phenomenology accessible and clear. Dermot Moran also deserves high praise for all his scholarship surrounding Husserl’s philosophy. He introduces the shorter edition of the Logical Investigations we’re using here. In addition, Moran worked with Joseph Cohen on The Husserl Dictionary which provided a well needed resource for all the recondite phenomenological words Husserl deploys, coupled with their difficult to pin down ideas. Categorial intuition (kategoriale Anschauung) (Moran, Cohen 59) is dealt with extensively throughout chapter six in Husserl’s Logical Investigations. Let’s begin to unfold the term by trying to understand how we come to perceive things. Essentially when we perceive something we find it “fulfilled” as matter and we also understand these things as “…beyond their nominal terms” (Husserl 339). Fulfillment is a special term Husserl uses to indicate a kind of conscious immersion in the way the object is presented in its perceptual way, but this also involves the structure of how it’s identified and how it is intended. We’ll address fulfillment first, then go back to identification, so “…the fulfillment is the experience of the coincidence between the empty intention [not immediately present] and its fulfilling object” (Moran, Cohan 130). This fulfillment happens during the broader act of intending, which means roughly “…the ‘aboutness’ or ‘directedness of our conscious state (Moran, Cohan, 167). This then indicates that even when we have the intention of an object before us it is a fulfillment to be in recognition of the fact that the object is presently and fully regarded. The object is fulfilled during the intention of it. When absent the object is not present in this way—it is emptily intended “…in its intuitive absence it is [symbolized] …in a token way…” (Moran, Cohen 104). The categorical is not the object itself but the way the object is present to our understanding of it. Sokolowski calls the categorical a “syntactical” (128). The word syntactical is a big hint that the categorical is a structural component that helps us understand our relationship to how we perceive the world in the round. Therefore, a syntactical structuring isn’t a component of linguistics exclusively, but to be regarded within experience in general, where the categorical is representative of the syntactical framework of experience. Husserl indicates that the categorical is connected to the syntactical term: “copula” (339). When Husserl writes of categorical intuition as it relates to a piece of white paper, he’s keen to make it clear that in a sentence like “white paper is paper which is white” the word “is” is categorical (341). With all of this said, categorial intuition is much more than just the word “is”, it simultaneously has to do with how the presence of the is-ness of white is intuited within the perceptual experience and not built upon it. It has to do with the being of whiteness presented to us as we experience the paper. As Husserl puts it, it is how “…the apparent object announces itself as self-given” (341). There are points where Husserl calls the categorical “supersensuous” (349), probably to indicate that it involves the sensuous, while at the same time, the categorial also involves more than just sense. Sokolowski identifies the categorical in the way that the object is known to us as “presencing” (129). This is not a feature of the object in and of itself, but how it’s known to me in all its verisimilitude. This is a phenomenological way to explain and to present how an object is made objective not in successive steps, but simultaneously within the actual experience, where identification is brought together within the “presencing” of a particular object (Sokolowski 129). Sokolowski writes that this coming together of identity and presence where “the identity, the belonging of a feature to its object, the object’s being and such, is what corresponds intuitively to word ‘is’ when we say, ‘S is p’” (131). We normally think of our world filled with stuff be we never stop to think of how we understand the in-between ‘is-ness’ of these things. The ‘is’ of these things has to do with the being of the things, yet even Husserl attests “among these [things] anything like ‘is’ is naturally not to be found” (345). A quick glance through the dictionary tells us that the meaning of the word “is” is the third person singular present of the word “be” (Oxford 715). This should give us the bigger hint that the idea of “is” has to do with being in a fundamental and experiential way. This “is” or its syntactical equivalents, do not just happen in subjective perception but in the fullest rush of all objective experience. So Husserl has to clarify that the intuition of the object as fulfilled and that our reflected judgment of a basic reflection is not something we do when we reflect on the “is” of something (347). Then he continues to define catergorial intuition partially by what it is not. Not in reflection upon judgments, nor even the upon fulfillments of judgments, but in the fulfillments of judgments themselves lies in the true source of the concepts State of Affairs and Being (in the copulative sense) (347). There’s a phenomenological job to decipher what Husserl’s pointing to as much as it is to notice that he’s saying that the categorical does not happen “upon” the judgments, or “upon” the fulfillment of judgments. States of affairs are about the tangible world as it’s presented to us in a particular way where the judgment is “…essentially involved with conceptualization and generalization” (Moran, Cohen 173). This is part of how we conceptualize being prephilosophically, we know something is here or it is not here without anyone needing to thematize the occurrence for us. Yet, it is only when we put name to this phenomena do we begin describe the philosophical import of these primary acts of cognition that appear to elude everyday expression and then some. Looking onward, anyone who has read even a little bit of Heidegger will know of the utmost precedence he placed on ontology—re: Dasein and being. Sokolowski, Moran and Cohen together attest the curious fact that Heidegger was strongly impressed with Husserl’s discovery of categorical intuition as it is inextricably linked to being (Moran, Cohen 60), (Sokolowski 128). In Heidegger’s exhaustive preliminary section given in his description of the “fundamental discover[ies]” (27) by Husserl of the three concepts of intentionality, categorical intuition and the a-priori, Heidegger writes that the objectivity of “…categorical intuition is itself the objective manner in which reality itself can become more truly objective” then he broadens this to “there is no ontology alongside a phenomenology. Rather, scientific ontology is nothing but phenomenology” (72). There’s a reason Heidegger is calling the categorical intuition a discovery, because what was there to be discovered had been with us all along—being. We use it, but we don’t know how we’re using it. We’re living within it. We just don’t know how to conceptualize the way we’re living within it. Let us recall that Husserl does write of the categorical as related to being “…so the concept of Being can arise only when some being, actual or imaginary, is set before our eyes” (347). It’s easy to brush off Husserl only as a stepping-stone to better appreciate the mature Heidegger, which is what Heidegger might’ve approved of. The objective here is not to do that. All we had to do was look at one of Husserl’s terms unfold and then to notice that we have before us a phenomenological vantage that positions us before the expanse of experience itself—before Heidegger. The descriptive potential of trying to understand what catergorial intuition means will serve to broaden our capacity for knowledge of the abstractions that are involved with basic perception and how we intuit, experience and know them even before we put words to them. Heidegger, Martin. History of the Concept of Time. Trans, Theodore Kisiel. Bloomington, IN: Indiana University Press, 1979. Print. Husserl, Edmund. The Shorter Logical Investigations. Trans. J.N. Findlay. New York, NY: Routledge, 2001. Print. “Is.” The Oxford College Dictionary. New York, NY: Oxford University Press, 2007: 715. Print. Moran, Dermot and Joseph Cohen. The Husserl Dictionary. New York, NY: Continuum, 2012. Print. Sokolowski, Robert. “Husserl’s Concept of Categorial Intuition.” Philosophical Topics, 1982: 127-141. PDF file. Mark Matveyevich Antokolski, The Dying Socrates, 1875. Socrates died 2,412 years ago by drinking hemlock. The account of the trial that lead to his death sentence is famously documented by Plato in the Apology and also by Xenophon in his Apology. In the introduction to Xenophon’s two works, Raymond Larson tells us that Plato’s account of the trial was probably first hand, whereas Xenophon’s account was through the secondary source of a mutual friend of Socrates, Plato and Xenophon, a man named Hermogenes (17). Although the two accounts differ in certain respects, when combined, they offer the only historical records of the trial. 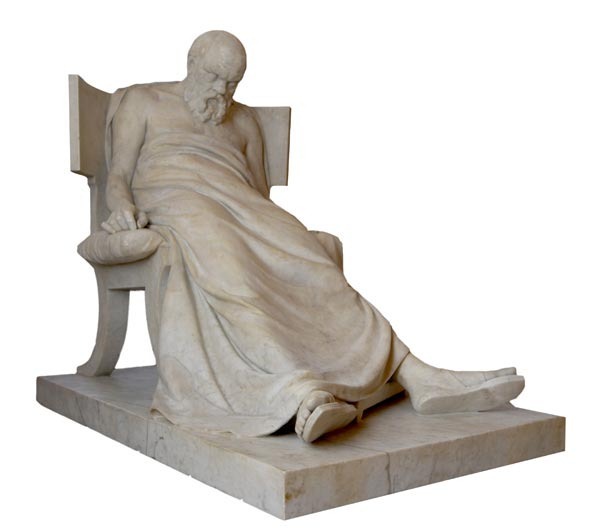 For this paper we’ll focus on the relevance of death and how mortality relates to the philosophy of Socrates. The way we understand Socrates is by knowing that he died doing philosophy. He was officially charged with impiety (asebeia/ἀσέβεια) and for corrupting the youth of Athens. But, it was also because he was making himself known by calling into question the widely held beliefs of those who would be offended when shown their opinions were wrong. The emphasis here will not be to focus on the charges or the trial outright, instead we will look at the attitude Socrates takes toward death itself in the two Apologies and how his unique way of contending and discussing death philosophically expands our own concepts surrounding end-of-life matters. It is in the extraordinary way in which Socrates eloquently speaks of death (thanatos/θάνατος) that inspires readers with his courage, fortitude and wisdom. He was willing to die for his cause, rather then to live into old age with compromise. As we all know Plato’s Apology is replete with references to death, probably because Socrates knew that he’d be given the death sentence. Not only does he seem to know that his death was immanent, but he extends the meaning of it to demonstrate that the fear of death is comparable to ignorance. For the fear of death, men, is in fact nothing other than to seem wise, but to not be so. For it is to seem to know what one does not know: no one knows whether death does not even happen to be the greatest of all goods for the human being; but people fear it as though they knew well that it is the greatest of evils (29a-b). C.D.C. Reeve in his book on the Apology rightly compares this statement to what he calls “the Digression” (180). This alignment is made with the celebrated ‘digressive’ statement made earlier in Plato’s Apology, where Socrates claims to not be wise and that to be wiser one has to know what one doesn’t know (21b-d). All this is essentially and slyly positioned by Socrates to demonstrate a vital component of Socratic wisdom: know what you don’t know, or at least be cognizant of the fact that there are things that one can be ignorant of. This extends to the ultimate awareness about what we do know, in the sense that sometimes what we think we know more than we do and this might actually be a way to conceal a fundamental ignorance. So how, according to Socrates, can we know that death is something to be feared since we don’t know what happens after death? As we can see, this illustrates a typical problem and habit we have with fearing most of what we cannot understand, in this mindset, things that we don’t understand are things to fear, at least if we are ignorant of the fact that we need not always fear the unknowable, as with the benign things that are unfamiliar or even death itself. Not only do we fear death, but we also fear ignorance itself. It is for this reason that we often wish to conceal ignorance and death at all costs. So, the underlying lesson in the dual example of death and not being wise is manifold. To be wise, is to embrace your own ignorance, at least to the extent that you’re aware of it enough to know when you’re hiding behind knowing something when you really don’t. And it also shows that the fear of death is not something to avoid, but is something to face with fresh eyes, since it’s ultimately inevitable. Socrates cleverly demonstrates that the unknowability of death can disclose these things. Xenophon’s Apology, as mentioned, does differ from Plato’s, it’s considerably shorter and it also depicts Socrates as having a slightly more down-to-earth attitude toward the issue of his impending death. For Xenophon’s Socrates, death is a welcome avoidance of the infirmities one would possibly have to endure with as old age advances. But now, if my life continues, I know I’ll have to pay the price of old age […] What pleasure will I get out of life if I see myself deteriorating and reproach myself for it? […] A person is bound to be missed if he passes away with a healthy body and a soul capable of amiability. […] I’ll offend the jury and choose death like a free man rather than slavishly beg for the worthless gain of continued life (6-9). Here, in Xenophon’s account, as it was conveyed to him by Hermogenes, Socrates almost suggests that to beg for life would be cowardly. It should be evident why death would appear to be the better option, because he would be dying for his cause. As Socrates attested near the end of Xenophon’s account, “I never harmed anyone or made anyone bad […] I helped those I conversed with by freely teaching them every good I was able” (26). It is for these seemingly simple reasons that we are still remembering Socrates—he was a great teacher. In our contemporary era this example seems too quick, it is as if he’s too eager to die. Nowadays we do not hesitate to think in terms of clinging to life at all costs. No matter what, death is always to be avoided. Socrates presents us with an alternatively extreme view that sometimes death is better than life. We must advocate such a view with caution and without any haste, but we do know that the untimely death of a wise man can serve to emphasize his altruistic and noble cause to do philosophy. We still think of Socrates as wise and that he died for his cause. To continue on this thantic theme, we should include a few more things that shouldn’t be left out. We’ll be sure to recall the oft-repeated quote given by Socrates toward the end of Plato’s Apology after the jury has found him guilty and he is asked to give a ‘counterproposal’ to a possible death sentence. As Socrates speaks, he mildly suggests a possible exile where he would continue his work and the young would listen to his teachings and his way of doing philosophy (37d). He continues with the conviction that even in exile he wouldn’t stop “…conversing and examining both myself and others—and that the unexamined life is not worth living for a human being…” (38a). Although he is not explicitly speaking of death in this quote, the implication is too strong to ignore. Again, to paraphrase, Socrates is positioning the claim that if one doesn’t actively examine, interrogate and inquire about life and how to live it, he is better off dead. This idea demonstrates his predicament as much as it shows his wisdom. If he is (and, as we know he will be) presented with the death sentence, he can no longer practice his work of doing philosophy, therefore, he can no longer examine life, since he might be asked to keep silent in exile. The lesson is not lost on us either, if we are to truly live an examined life we much inquire, question and examine life as much as we can. Curiosity is at the base of this suggestion. All we have to do is act with a similar conviction to know more about life. As the trial unfolds in Plato’s Apology, he is in fact, given the death sentence to drink the poisonous hemlock and then he gives his pensive closing remarks. Now that he knows his fate, he has no regrets about the way he defended himself “I prefer to die having made my defense speech in this way than to live in that way” (38e). When he says that he didn’t want ‘to live in that way’ he must have meant that he is proud that he didn’t have to grovel nor beg for his life. This connects with Xenophon’s record to show that Socrates was not willing to compromise his values at any expense, thereby setting a laudable example for the people of Athens and for posterity. There is another strangely appropriate quote in Plato’s retelling where Socrates is continuing to talk after the death penalty is read, this is where he is sorting through the notion that escape from death could have been a possibility for him had he made a stronger more eloquent plea and defense. “But I suspect it is not hard, men, to escape death, but it is much harder to escape villainy. For it runs faster than death” (39a-b). This is easily directed at his accusers and the percentage of the jury who condemned him to die. The villainy of deciding that someone should die for showing people the truth is not as far-fetched as it sounds on the surface. We already know that sometimes people don’t like to be told the truth of things, namely if the truth is made to expose their ignorance, since we don’t like to be shown to not know something. Villainy is typically characterized as evil, crafty and deceitful, among other things. If we think just for a second about these qualities in comparison to what Socrates is saying, we see his point. People are quick to judge others, it’s easy to find flaw with someone else and it is easy to misinterpret things if we’re not thinking carefully. But villainy calls for darker motives, it’s faster than death because it can’t stay anywhere for too long. A villain doesn’t want to be figured out so he will move with speed, yet the speed belies his deeper problem of plain old ignorance. This kind of ignorance resides in all of us and usually we’re too afraid to see it—to know it. Socrates teaches us these things and then some. His way demonstrates that we must not be afraid to say we don’t know everything, something and nothing. To be sure, this leaves us with four more pressing questions that have already been implied. How do I contend with my own ignorance? How do I contend with my own death? Then, how does this help me contend with the ignorance of others? And what wisdom is to be had when we witness and contemplate the death of others? Larson, Raymond. The Apology and Crito of Plato and the Apology and Syposium of Xenophon. Lawrence, KS: Coronado Press, 1980. Print. Plato and Aristophanes. Four Texts on Socrates. Trans. Thomas G. West and Grace Starry West. Ithaca, NY: Cornell University Press, 1998. Print. Reeve, C.D.C. Socrates in the Apology. Indianapolis, IN: Hackett Publishing Co., 1989. Print. The plant from which the hemlock Socrates is made to drink is formally known as Conium. It is a large flowering weed which resembles parsley and grows in many parts of the world, including here in Colorado.